I have been running a 7-8 man group for a year now, although it has recently leveled off to 7 players being the norm, with usually 1 missing a session here or there. Some players came in later, and I had the bad idea (although well intentioned) of starting them a few levels behind the rest of the party. Because of that, I hit a situation where my players were not all of the same level, causing issues in the encounters and the way they were being designed. Last night finally, all that changed, and I am happy to report that the game ran better, a lot better than I was hoping for. I decided to level up everyone equally, and even if you miss a session, you’ll be at the same level as everyone else. It just makes life easier for me in the end as a DM, to know that the encounter I am throwing is appropriate for all players at the table, and not just 5 of the guys. For the past year, my group has been carelessly cutting through my encounters because I was gimping the monsters to accommodate the lower level guys. Yesterday though, they finally felt the force of a full blown hard encounter for their party level, and one of the PC’s even fell in battle. The party is at level 8, they faced a level 9 brute solo Bloodkiss Beholder from Open Grave. The fight was nasty, but they were challenged the way they should have been challenged. A hard fight for their level. Who's your daddy? He was last night. So here is a lesson for newbie DM’s out there: I’ve blogged before about level discrepancies, but now I put it to the test. Do yourself a favor; you are not doing anyone a favor by having lower level guys mixed in with higher level players. It does a party no good to have a less effective striker in the party for example. Plus, your encounters will become easier to design, and the result will be more rewarding and enjoyable to your players. Trust me on this. My player’s complained about no-show players being awarded XP, but you know what? Too bad. We DM’s have enough to worry about, to also have to be adjusting treasure parcels and encounters for mixed level parties. I’ll never worry about that again, and neither should you. Random plot hook of the day: A group of kids went to play in an abandoned crypt, and one of them ran out saying the others had their blood sucked out by a beast. This kid barely made it out alive, but his description is terrifying. What happened? Well. A bloodkiss beholder happened, duh. ← The demographics of 4th. Ed. That’s the same monster that caused my first PC death in my campaign, and almost caused a TPK. It was a challenge even though there were two Paladins present, and everyone had to change tactics completely. I guess my older edition roots are showing, I just couldn’t stomach giving XP in such a manner. But I also loathe level based encounters. But in this case, even assuming the level based encounters, this still feels wrong. Well, redundant. If you are going to award XP equally, attending or not, don’t award XP. Its a redundant step. Just set sessions/weeks where leveling occurs. The same effect and much easier paperwork. The party levels every other week, or third week or hell every week depending on your prefered play style. I have always leveled up the players the same level. I’ve always felt that players shouldn’t be punished for having a life and not making it to the game because something came up. I’ve also learned from other DM’s who did have characters start at lower levels and they/I would die because the encounters were too hard, etc. It was extremely frustrating and players lost interest in the game. I was in a 3E game once where the level discrepancy got so bad that no encounter I could throw at the players would grant everyone XP. Either the CR was too low or too high to award XP for the outliers. By that point, the game was pretty unplayable. RE: If you are going to award XP equally, attending or not, don’t award XP. Its a redundant step. Because of this issue, some of the games I am in now have done that. These games just have a “campaign level” which all the characters are at. The DM simply raises the level when he feels it is appropriate. On the other hand, the DM of that game tends to reward the players who attend in other ways, usually at the end of a campaign arc. For example, he gave all of the characters who attended at least 80% of the “moathouse” sessions the Endurance feat for free. It’s hard to judge based on your description exactly how many players were below the party average and how far. But hey, it’s supposed to be a cooperative game. Can the other party members not take up the slack and/or watch out for the newer members? I’ve played in games where I was a few levels lower than the party. Sometimes it meant I had to run away from encounters while the party was still engaged (and find a way to fight ranged). Or, I had to find a way to limit my exposure to begin with. Or, the party pooled their cash and bought me extra healing potions. Players should be deciding what encounters they’ll undertake and what encounters they’ll run from, in my opinion. Yeah, XP discrepancies never seemed like a good idea to me. Wanting to castigate a player for attendance problems is understandable, but I can’t imagine that forcing his power level down below the status quo (so that he has to struggle to pull his weight) is going to make him want to come more often. I’d like to point once again to the alternative that I wrote about in the comments of your previous post on your subject. I think what I spelled out is a good way to encourage participation, discourage missed sessions, and still keep the game perfectly balanced. I wonder who the “less effective” striker is in our party???? Is it the Eladrin Warlock jumping around the battlefield trying to be a defender?? the Human Rogue that is bloodied or immobilized half the time and then cowers in the corner??? the Elven Ranger that can’t hit the broadside of a barn??? Good call on bringing all players to the same level. 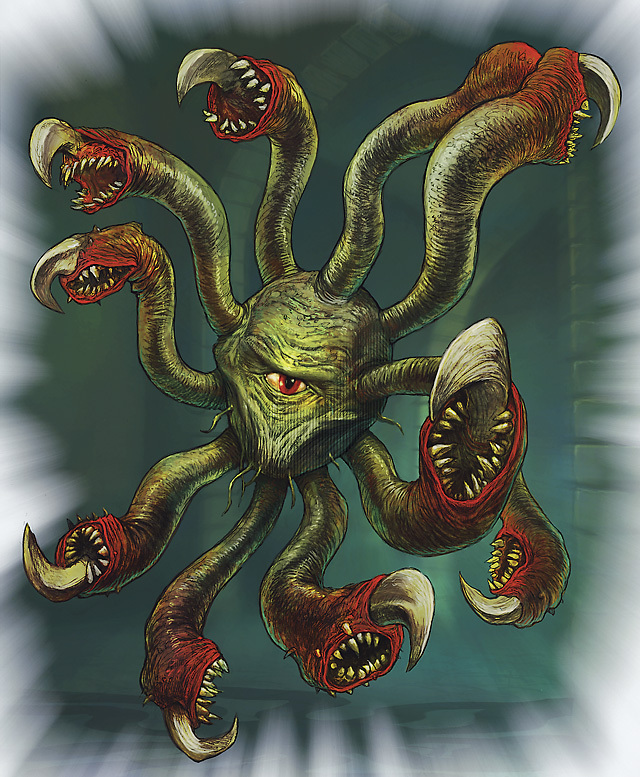 I too just had a group of 4 level 9 PC fight a Bloodkiss Beholder and we all absolutely loved the fight. It was hard in all the right places as you say. I have to concede to newbie on this one. 4e was created for balance. Not one class or race is more powerful than the next and every class has its role in the game. The beholder battle gave it to us good. It was the toughest encounter we had since we started the game and it was because we were all the same level. I suppose this is a bit late, but I think my DM has found the perfect solution to the problem of absenteeism and XP, and I don’t see it mentioned too many places. Players only earn XP for the games and encounters they show up for, but players who fall behind by missing a session earn 150% XP the next time they show up, and continue to earn 150% XP until they catch up with the rest of the group. It’s great because the act of earning XP continues to be a meaningful accomplishment, but players who aren’t chronically absent will never be more than a level behind, and even then, not for very long. @Mugen never too late, that does seem like a good fix to the issue. thanks for sharing. 1. Start replacement PCs with half the XP of deceased PCs. 2. Cap the level gap for new & replacement PCs at 3 levels, so they’re always more than half as powerful as the highest level PC. 3. Give PCs below the level of the highest level PC x2 XP, so they catch up. This avoids disruption from drop-in single-session PCs, avoids issues of where-did-that-high-level-guy-come-from, still penalises death, but avoids a death spiral and lets new PCs catch up over a reasonable time frame.